I have a couple orchids at home but have not had great success with them. Sandy Mason, Illinois Master Gardener Coordinator, writes the following about orchids. 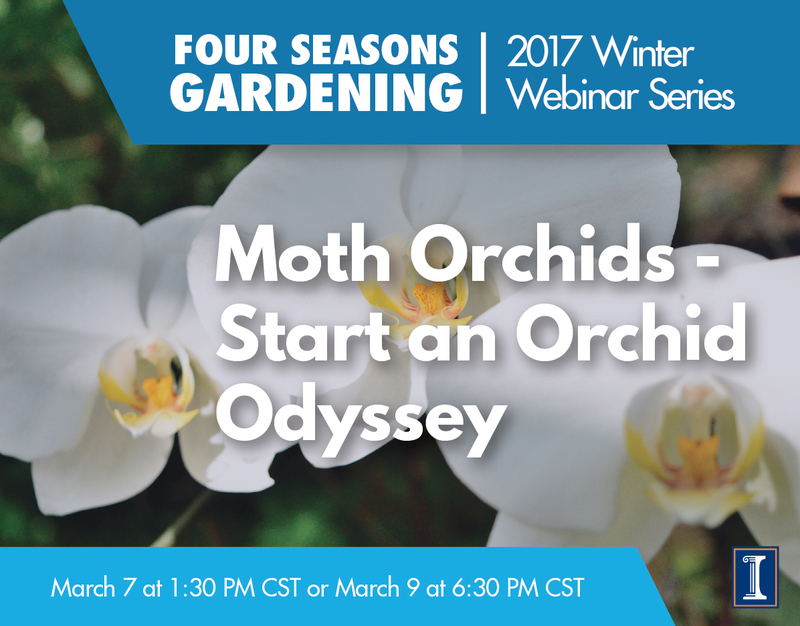 She also teaches a webinar about moth orchids. I'm hoping that Sandy will show me how to make my orchids grow better. Not all orchids enjoy the temperature and humidity commonly found in homes; therefore, some may require special lighting and humidity control for indoor growing. "An orchid obsession is easily cultivated by many enthusiasts," Sandra Mason says. "However, if you are looking for an easy-to-grow and elegant houseplant, moth orchids are a great option. "Phalaenopsis or moth orchids possess dark, shiny green leaves adorned with showy flowers of pink, white, or yellow. Imagine a flock of fluttering moths dancing on an arching high wire," Mason says. "Moth orchids are native to Asian jungles. In the U.S., we find them in stores fluttering next to the apples and lettuce or lumber and nails. According to Mason, moth orchids are not only easy to grow but also one of the easiest to encourage to re-bloom. 'Sussex pearl,' femme fatale,' or 'southern ruby' are just some of the 12,000 hybrid "phals" available. The flowers will last an amazing two to five months. "I had one flowering in my office for so long, visitors thought it was a wax replica," Mason says. Unlike other common houseplants, moth orchids do not live in soil. They are epiphytes, so-called air plants. As Asian jungle natives, they cling with long thick roots to rocks and trees. Their moisture is gathered from rain, dew, and humidity and their nutrients from decaying leaves and other debris that accumulates among their roots. "This likely does not describe your living room," Mason says, "but the conditions are fairly easy to reproduce by paying attention to light levels and watering practices, and using an orchid planting mix." Mason offers a few simple steps for growing moth orchids as beautiful houseplants. Orchids require bright light (but no direct sun) to bloom, such as an east or shaded west or south window. Generally, orchids bloom when night temperatures are cooler than day temperatures. Orchids appreciate high humidity between 40 and 85 percent; however, moth orchids are more forgiving than many orchids of the dry air in our winter homes. Orchids need thorough watering and regular fertilization during their growing season. The potting mix should provide good air penetration and fast water drainage. Learn more about Sandy's orchid tips at her webinar when she will discuss how this easy-to-grow moth orchid makes an excellent houseplant. In this webinar, state Master Gardener Coordinator, Sandy Mason, will help you learn how to grow, repot and even rebloom moth orchids. Moth Orchids–Start an Orchid Odyssey is presented live on March 7 at 1:30 p.m. and again on March 9 at 6:30 p.m. All sessions are available for live home viewing. Contact your local Extension office to inquire about attending the webinar at the Extension office. Following the session, a taped version is available on YouTube. Registration and YouTube information are found at http://web.extension.illinois.edu/hmrs/4seasons.